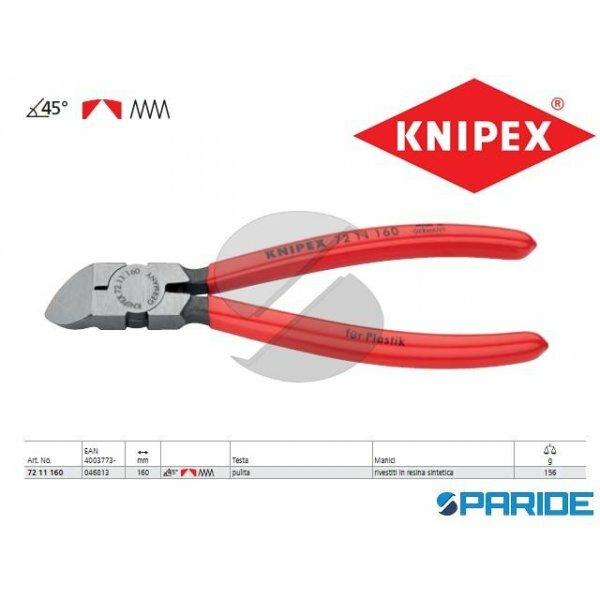 TAGLIABULLONI DI PRECISIONE 71 72 460 KNIPEX. 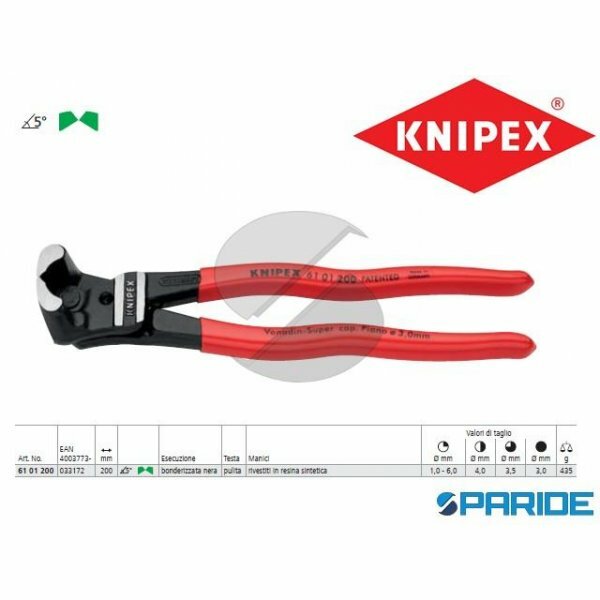 PINZA TESTA BONDERIZZATA GRIGIA CON MANICI RIVESTITI IN MATERIALE BICOMPONENTE. 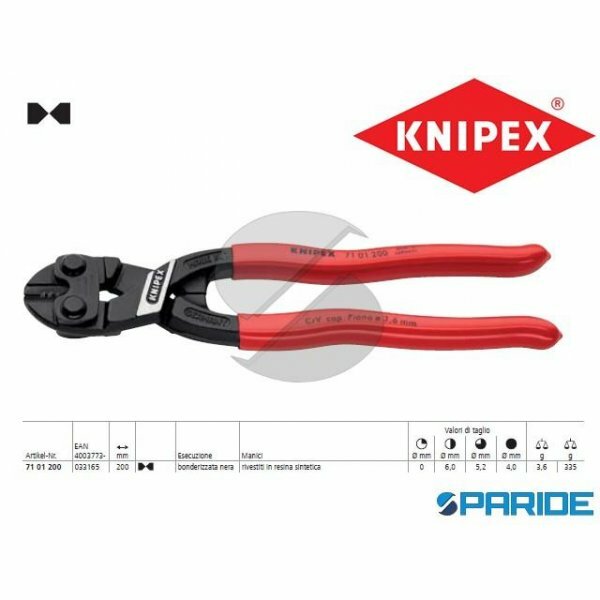 CAPACITA DI TAGLIO FINO AD UNA DUREZZA DI 48 HRC; TAGL..
TRONCHESE CON TAGLIENTE 61 01 200 FRONTALE PER BULLONI KNIPEX. PINZA BONDERIZZATA NERA TESTA PULITA, MANICI RIVESTITI IN RESINA SINTETICA. 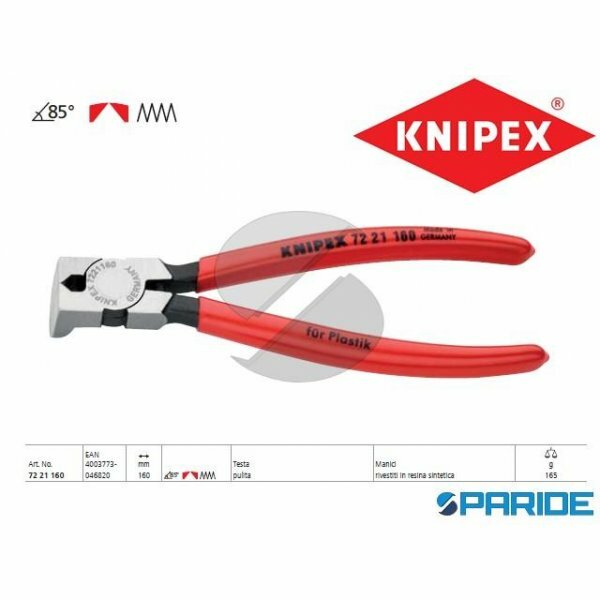 ROBUSTO, COMPATTO, CONFORTEVOLE; MAGGIORE..
TRONCHESE CON TAGLIENTI 74 21 250 CENTRALI KNIPEX. PINZA BONDERIZZATA NERA TESTA PULITA, MANICI RIVESTITI IN RESINA SINTETICA. 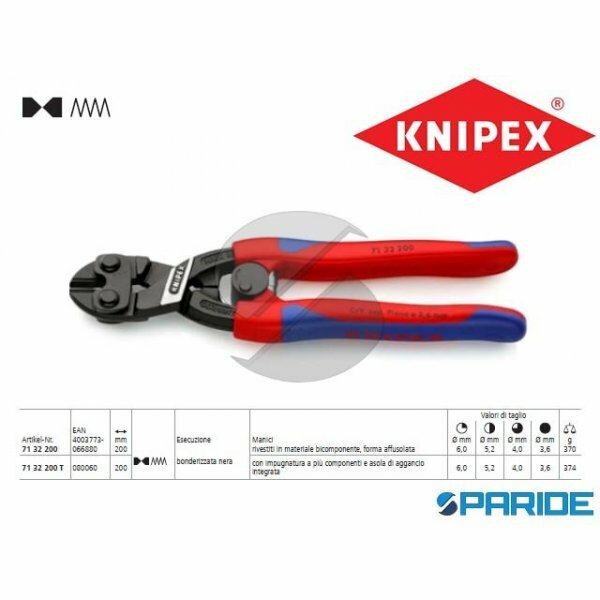 PER MASSIMA SOLLECITAZIONE CONTINUA ELEVATA CAPACITA ..
TRONCHESE DOPPIA LEVA 71 01 160 COBOLT KNIPEX. 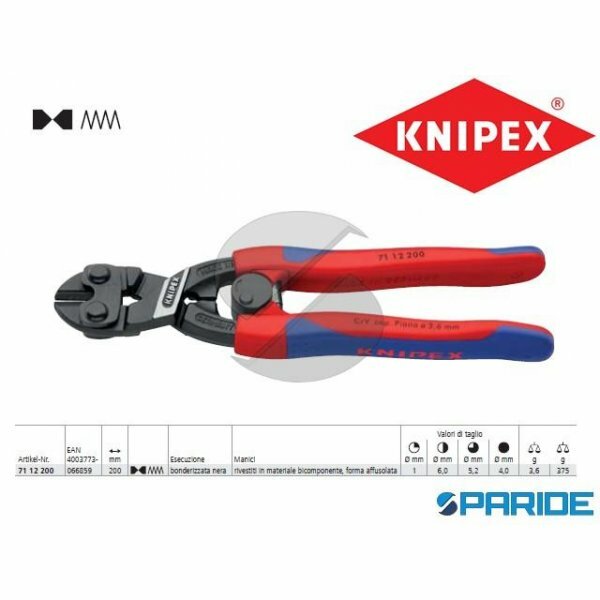 PINZA BONDERIZZATA NERA CON MANICI RIVESTITI IN MATERIALE BICOMPONENTE. CON TAGLIENTI DI PRECISIONE PER FILO A BASSA E AD ALTA RESIST..
TRONCHESE DOPPIA LEVA 71 01 200 COBOLT KNIPEX. PINZA BONDERIZZATA NERA CON MANICI IN RESINA SINTETICA. 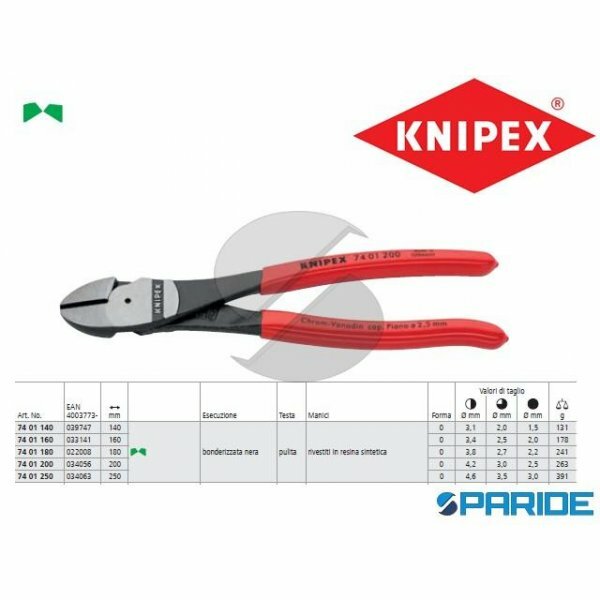 CON TAGLIENTI DI PRECISIONE PER FILO A BASSA E AD ALTA RESISTENZA E PER FILO ..
TRONCHESE DOPPIA LEVA 71 01 250 COBOLT KNIPEX. PINZA BONDERIZZATA NERA CON MANICI IN RESINA SINTETICA. 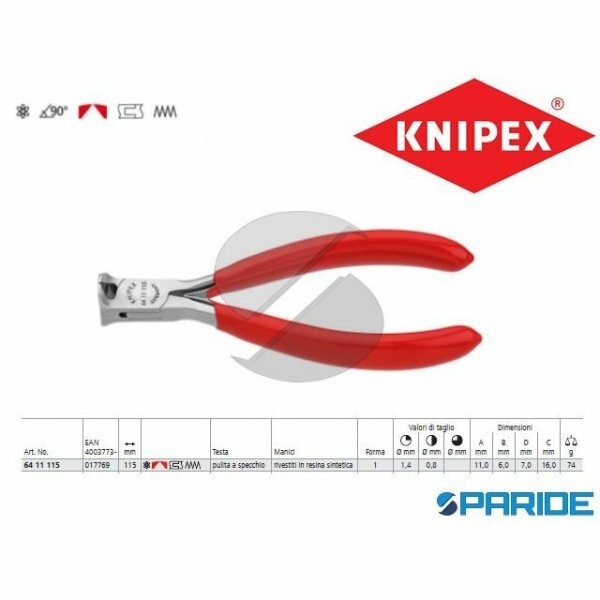 CON TAGLIENTI DI PRECISIONE PER FILO A BASSA E AD ALTA RESISTENZA E PER FILO ..
TRONCHESE DOPPIA LEVA 71 12 200 COBOLT KNIPEX. 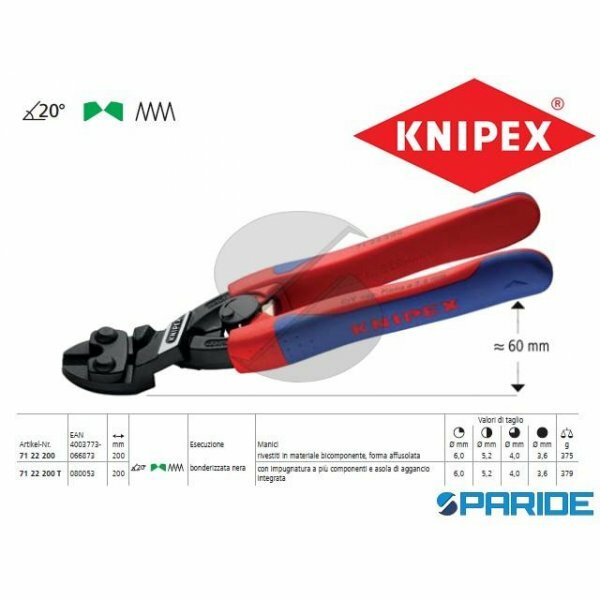 PINZA BONDERIZZATA NERA CON MANICI RIVESTITI IN MATERIALE BICOMPONENTE. CON TAGLIENTI DI PRECISIONE PER FILO A BASSA E AD ALTA RESIST..
TRONCHESE DOPPIA LEVA 71 22 200 COBOLT KNIPEX. 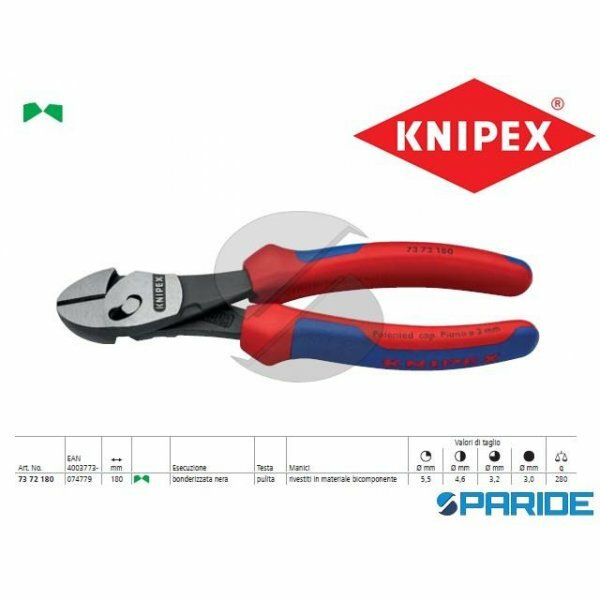 PINZA BONDERIZZATA NERA CON MANICI RIVESTITI IN MATERIALE BICOMPONENTE. CON TAGLIENTI DI PRECISIONE PER FILO A BASSA E AD ALTA RESIST..
TRONCHESE DOPPIA LEVA 71 32 200 COBOLT KNIPEX. 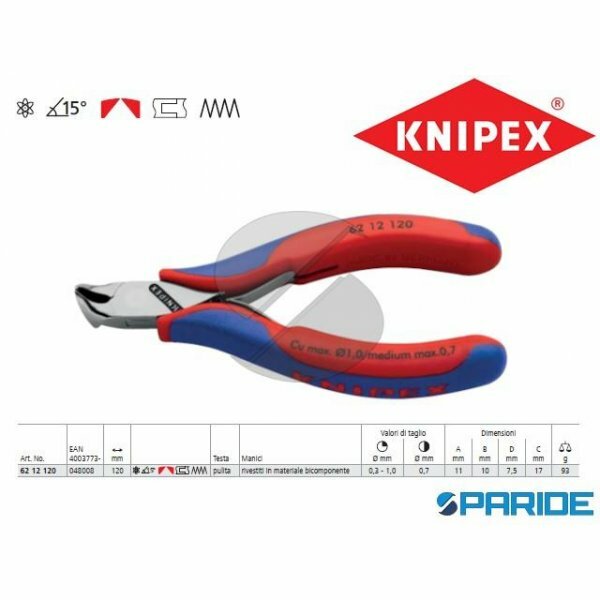 PINZA BONDERIZZATA NERA CON MANICI RIVESTITI IN MATERIALE BICOMPONENTE. CON TAGLIENTI DI PRECISIONE PER FILO A BASSA E AD ALTA RESIST..
TRONCHESE DOPPIA LEVA 71 41 200 COBOLT KNIPEX. PINZA BONDERIZZATA NERA CON MANICI IN RESINA SINTETICA. 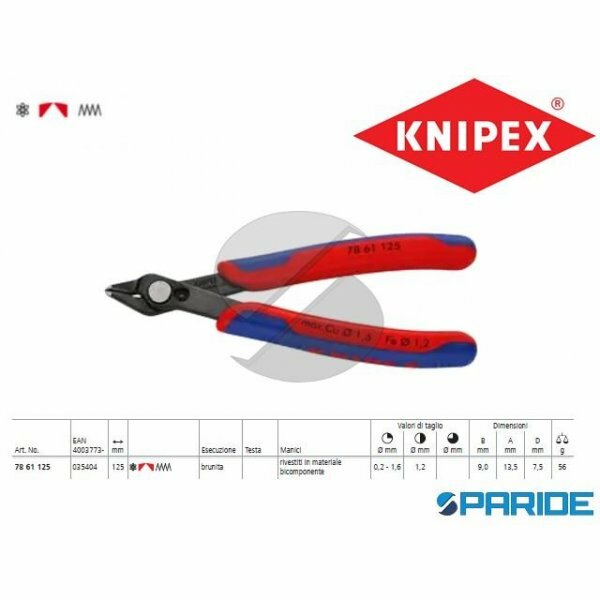 CON TAGLIENTI DI PRECISIONE PER FILO A BASSA E AD ALTA RESISTENZA E PER FILO ..
TRONCHESE LATERALE 73 02 160 X-CUT KNIPEX. FORTE, LEGGERO E UNIVERSALE; TRANCIA CON PRECISIONE SIA I FILI PIU SOTTILI, SIA CAVI A CONDUTTORI MULTIPLI E IL FILO ARMONICO PIU DURO; C..
TRONCHESE LATERALE 73 72 180 TWINFORCE KNIPEX. 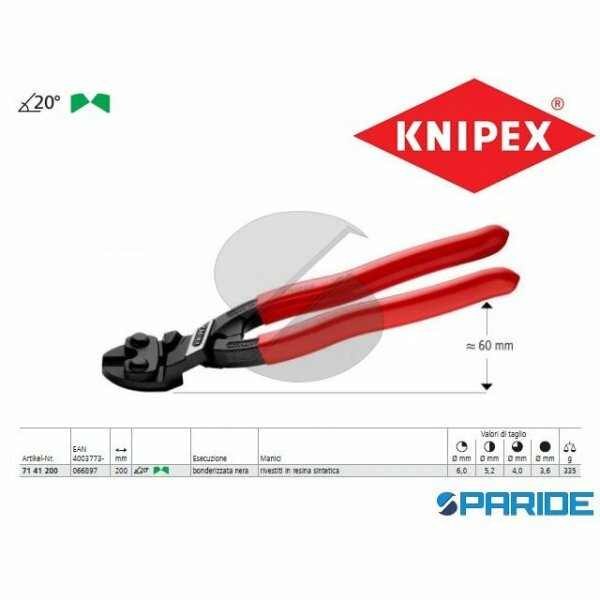 IL TRONCHESE CON TAGLIENTE LATERALE DI QUALITA SUPERIORE CON DOPPIA ARTICOLAZIONE BREVETTATA RAPPORTO DI TRASMISSIONE DI FORZA OTTIMA..
TRONCHESE LATERALE 74 01 200 PER MECCANICA KNIPEX. TRONCHESE BONDERIZZATA NERA, CON MANICI RIVESTITI IN RESINA SINTETICA. PER MASSIMA SOLLECITAZIONE CONTINUA ELEVATA CAPACITA DI CA..
TRONCHESE LATEERALE 79 22 125 DI PRECISIONE PER ELETTRONICA KNIPEX. TRONCHESE BRUNITA TESTA PULITA MANICI RIVESTITI IN MATERIALE BICOMPONENTE, TESTA TONDA. 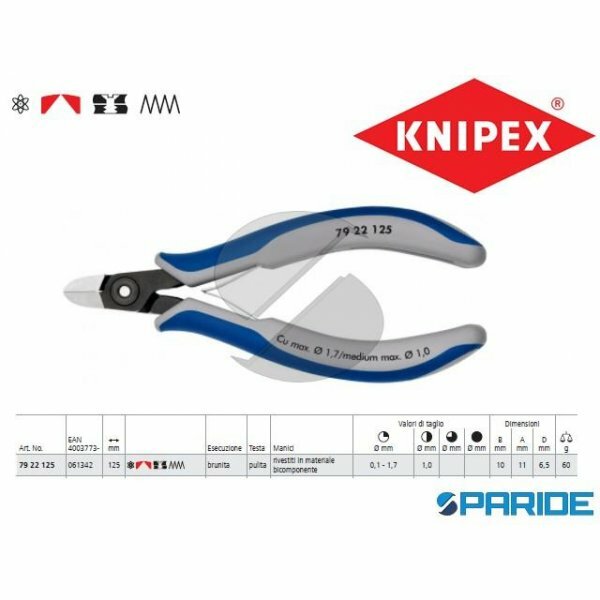 PINZA PARTICOLARMENTE AD..
TRONCHESE PER ELETTRONICA 62 12 120 CON TAGLIENTI INCLINATI. TRONCHESE TESTA PULITA CON MANICI RIVESTITI IN MATERIALE BICOMPONENTE. 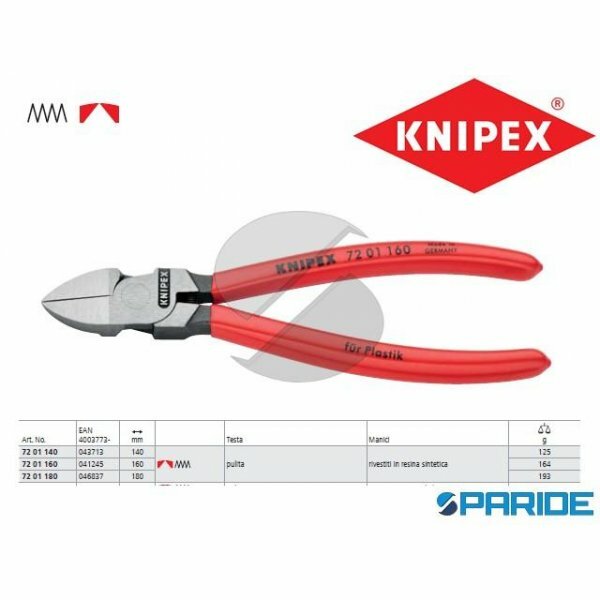 CON TAGLIENTI PER FILO METALLICO A BASSA E MEDIA..
TRONCHESE PER ELETTRONICA 64 11 115 CON TAGLIENTE FRONTALE KNIPEX. PINZA TESTA PULITA A SPECCHIO CON MANICI RIVESTITI IN RESINA SINTETICA. 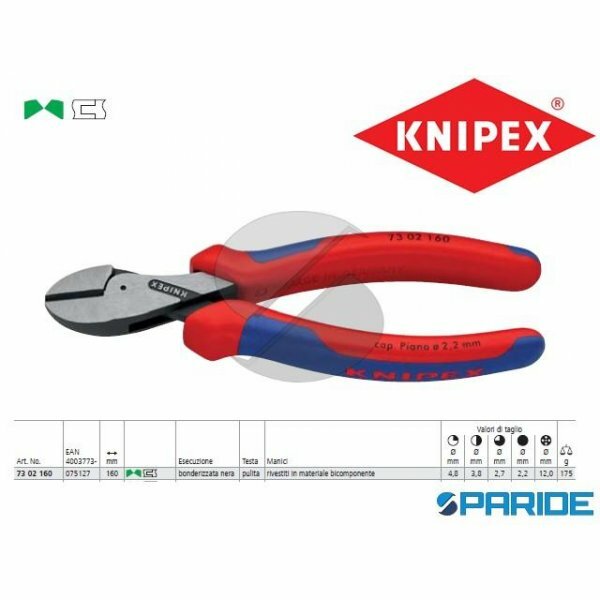 PINZE PARTICOLARMENTE ADATTE PER IL TAGLI..
TRONCHESE PER RESINA SINTETICA 72 01 160 KNIPEX. 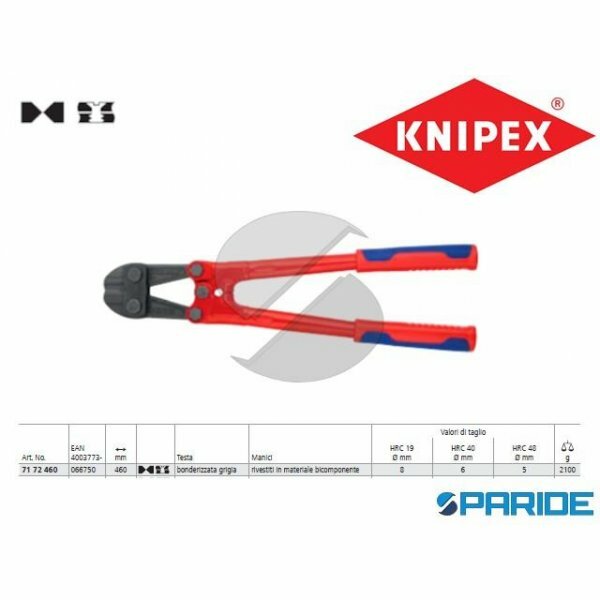 TAGLIENTI RETTIFICATI PER TAGLIO RASO; PER UN TAGLIO RASO DI BAVATURE DI RESINA SINTETICA; TRANCIA DI NETTO I MATERIALI DOLCI COME ..
TRONCHESE PER RESINA SINTETICA 72 11 160 KNIPEX. BECCHI A 45 GRADI. 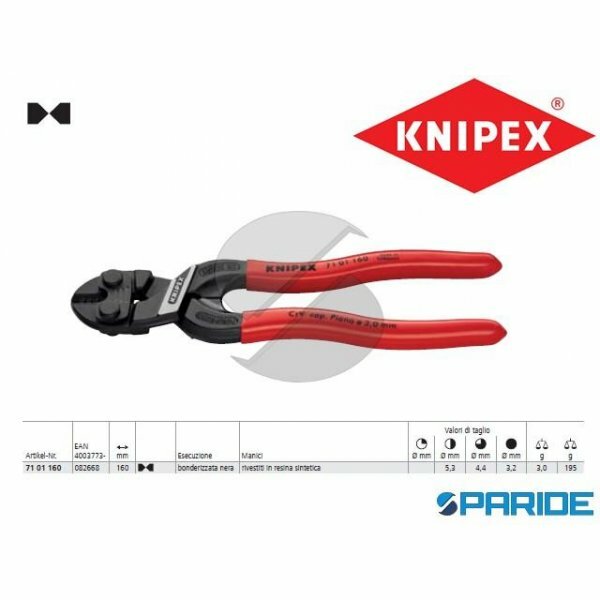 TAGLIENTI RETTIFICATI PER TAGLIO RASO; PER UN TAGLIO RASO DI BAVATURE DI RESINA SINTETICA; TRANCIA DI NETTO I MA..
TRONCHESE PER RESINA SINTETICA 72 21 160 KNIPEX. 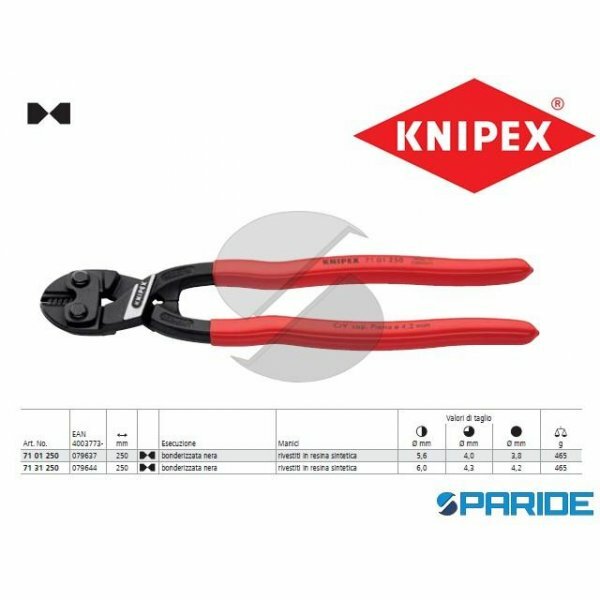 PER MASSIMA SOLLECITAZIONE; APPREZZATA DAI PROFESSIONISTI PER LA LAVORAZIONE PRECISA; USURA LIMITATA E PESO EQUILIBRATO; DUREZZA DE..
TRONCHESE SUPER KNIPS 78 61 125 PER ELETTRONICA DI PRECISIONE KNIPEX. PINZA TESTA PULITA CON MANICI RIVESTITI IN MATERIALE BICOMPONENTE. PINZE PARTICOLARMENTE ADATTE PER IL TAGLIO ..